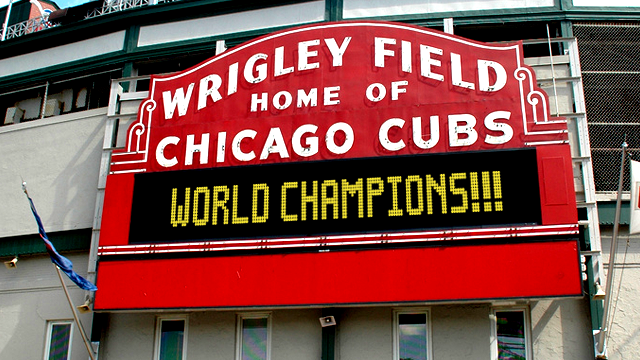 Wrigley Field – Past, Present, & Future Of Wrigley Field Cubs World Champions! Wrigley Field in Chicago, Illinois, is the second oldest ballpark in baseball, close behind Fenway Park in Boston (home to the Red Sox). 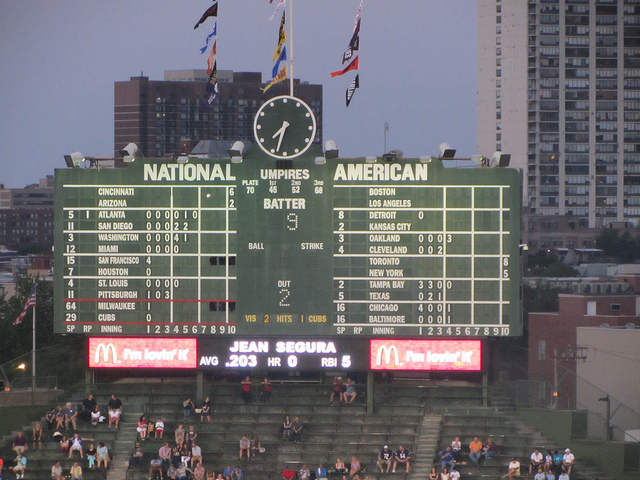 Nicknamed ‘Friendly Confines,’ it still retains the authenticity of the old days. 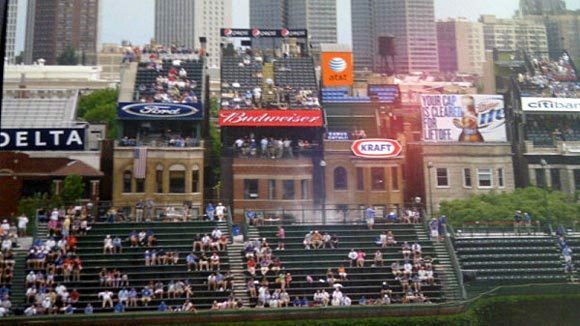 When fans come to cheer the Cubs, they don’t miss out on spotting a few highlights, like the marquee located outside their home plate entrance, ivy covered outfield walls, their classic hand-operated scoreboard, and more. The construction of the ballpark started on March 14, 1914, and ended on April 23, 1914, which also marked the first game played by the Whales. It turned into a 14,000 seat ballpark, with one exclusive V-shaped Grandstand and wooden bleachers all around. 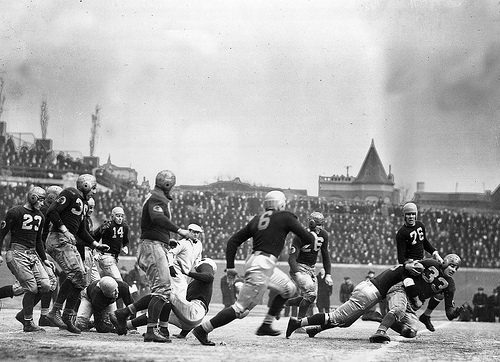 The original dimension of Weeghman Field was 310 ft. to the left, 356 ft to the right, and 440 ft in the middle. It was also the first ever ballpark to have fixed concession stands. The Chicago Whales would only play for two years because the Federal League soon went bankrupt. 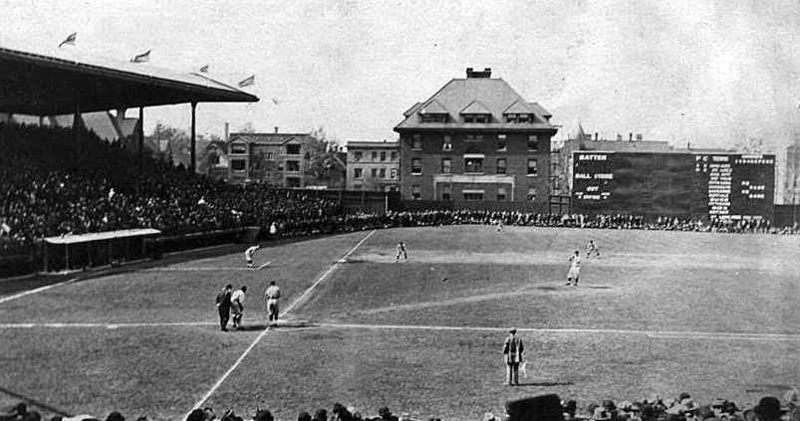 The Cubs used to play on the West Side Grounds from 1893, but by 1915 they were struggling for an audience. Charles Weeghman acquired them later that year and shifted the team to his field for the following season. Their first game was on April 20, 1916, and the ballpark was renamed ‘Cubs Park’ after Weeghman sold his acquisition to William Wrigley Jr.
During the early months of 1923, the park went through renovations. The Grandstand moved 60 ft back and there were new installations of wooden bleachers. This increased the capacity of the park to 20,000. It was further renovated in 1926, and the park was finally named ‘Wrigley Field’. There was then a double deck for the Grandstand, bleachers were moved from the left field, the playing area was lowered and the capacity reached 38,396. There were more implementations by 1937, and bleachers were constructed in the outfield. This was also when their renowned 27 by 75 ft hand-operated scoreboard was planted right behind the centerfield seating. The other highlight of ivy was also incorporated at this time. The lights were installed before the season of 1942, but were donated to the government for World War II. After many disapprovals and threats, the Cubs were allowed to install lights on the field. The first night game took place on August 8, 1988. There were private boxes constructed in 1989, on a mezzanine level which was initially used for broadcasting and the press. There was another one constructed in the upper deck right behind home plate. There were 200 seats added right behind home plate after the 2003 season which brought the audience closer to the field. There was a further addition of 1,800 seats in 2005, increasing the capacity to about 41,000 people. Wrigley Field was previously known to have a bad grass field because the infield crown extended 40 ft towards the outfield. Players ran up and down a hill during their games! This problem was resolved in 2007, with the help of a reformed drainage system. The playing field was then replaced with artificial grass. 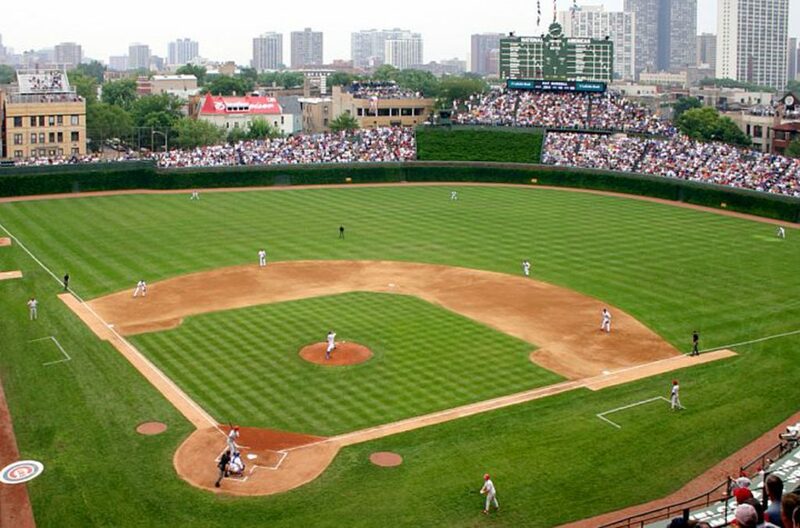 Wrigley Field is now the only existing Federal League ballpark. However, with all the lights and video board, it retains that old fashioned feel. One amusing fact about the field is that they don’t allow advertisements. However, many can be found on the sides of buildings in the neighborhood. Wrigleyville, the vicinity around Wrigley Field, bustles with ballhawks on game days. They wait at Waveland Avenue to catch home run balls. Lots of people sit on top of the building located behind the field to watch the game action. The ivy still overshadows the brick walls, while the scoreboard is manually operated. The neighborhood usually makes parking difficult for the games. Fans often opt to ride the CTA red line train to the Addison stop and then get to the field. Wrigley Field is the home of the Cubs, but it was also home to the Chicago Bears from 1921-1970 before they moved to Soldier Field. This historic area is currently undergoing a massive change, which is likely to revamp it like never before. After the renovations of 1937, the next big transformation is to overhaul all the facilities. It started after the 2014 season and is called the ‘1060 Project’. With a requirement of $575 million, it is all set to be complete in 2019. 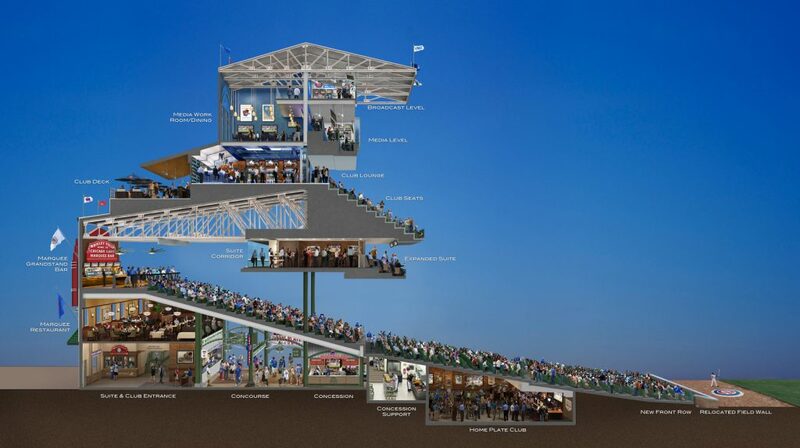 Every section of Wrigley Field will be upgraded, and it has already started with the outfield. The Cubs moved the exterior walls into Waveland and Sheffield Avenues to expand bleachers, which will add 300 more seats, and add concessions. One of the most striking additions is the HD video board of 95 x 42 ft to the left. There will also be another 2,250 square feet video board to the right. The Chicago Cubs took part in 11 World Series so far. In 1906, they lost to the White Sox 4 games to 2, but made it back to the World Series in 1907 and 1908, being the first team to play 3 straight years back to back. They were also the first team to win twice, but after that they went 108 years without a World Series win. It was the longest occurrence in all of the American sports. The Chicago Cubs were termed ‘Lovable Losers’ with multiple losing seasons. With superstars like Anthony Rizzo and Kris Bryant, the team accomplished their first World Series Championship since 1908, in 2016, after winning against the Cleveland Indians. Certain players on the Cubs were inducted into the Hall of Fame. They include Ernie Banks, Greg Maddux, Ryne Sandberg, Ron Santo, and others.